Can you have too many teal colors? I say no, especially when it comes to Blue Jay! Teal, heathered with green, it is lovely. You can see the difference between Blue Jay and Baltic Blue in the sixth picture above. 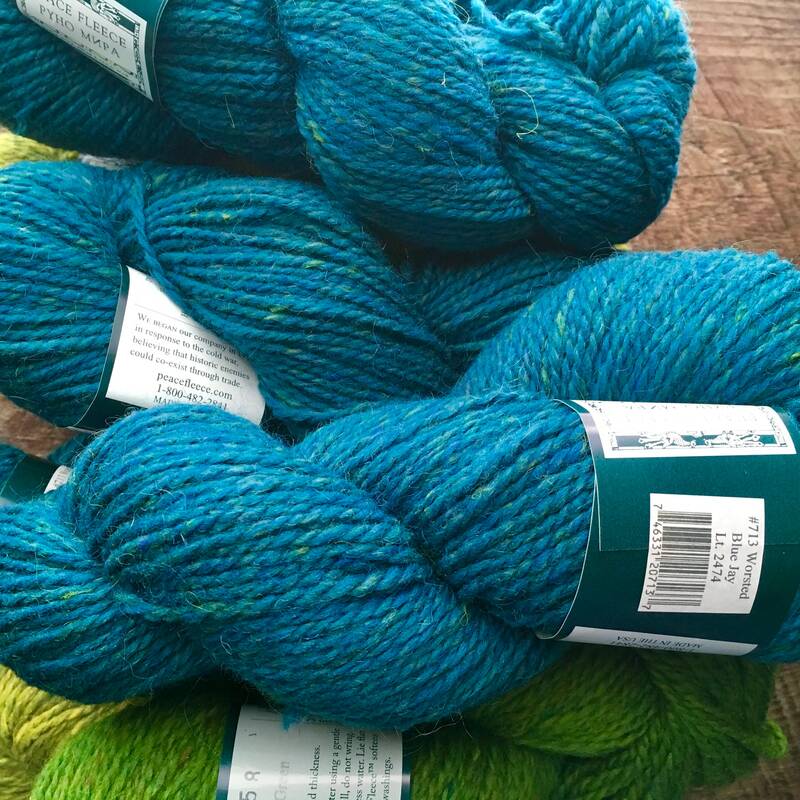 This color is gorgeous when worked alongside Lily Pad or Shaba Green. 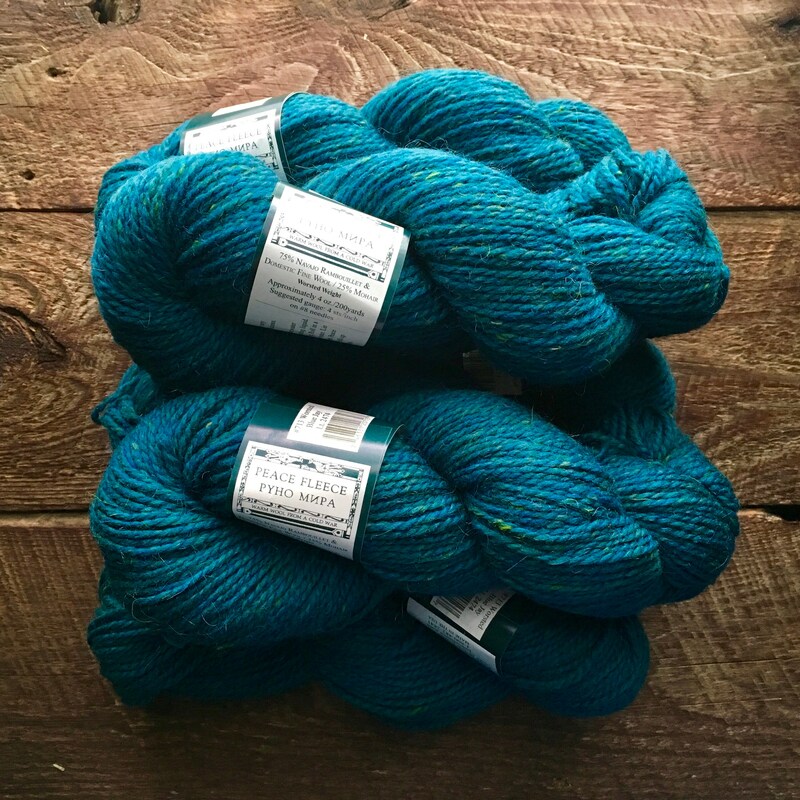 This worsted weight wool yarn is a Merino/mohair blend that is economical and unique. 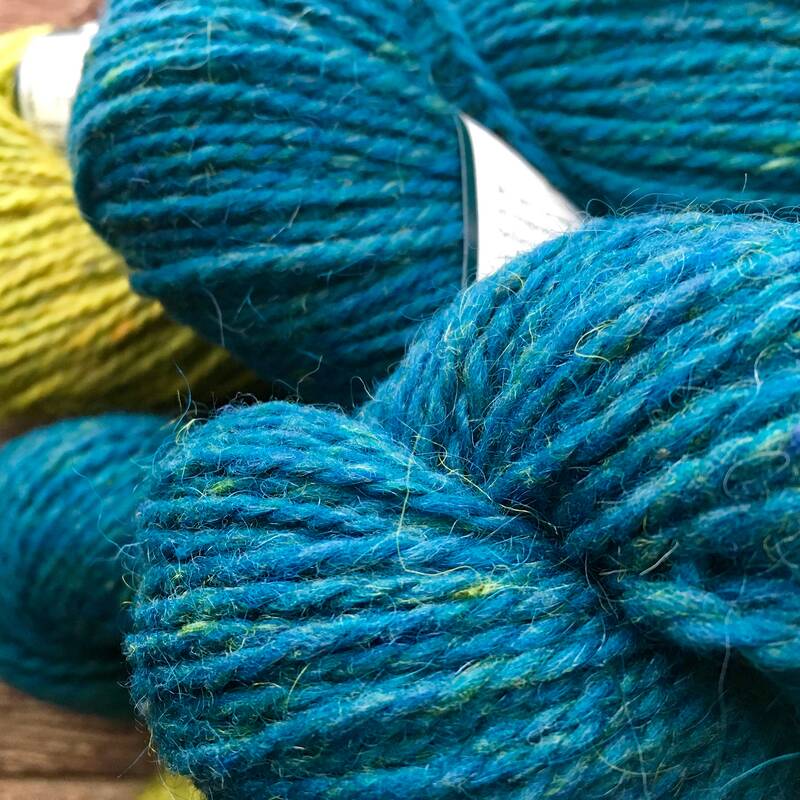 The mohair will eventually create a lovely halo about your project that will make you love it more every time you wear your project. 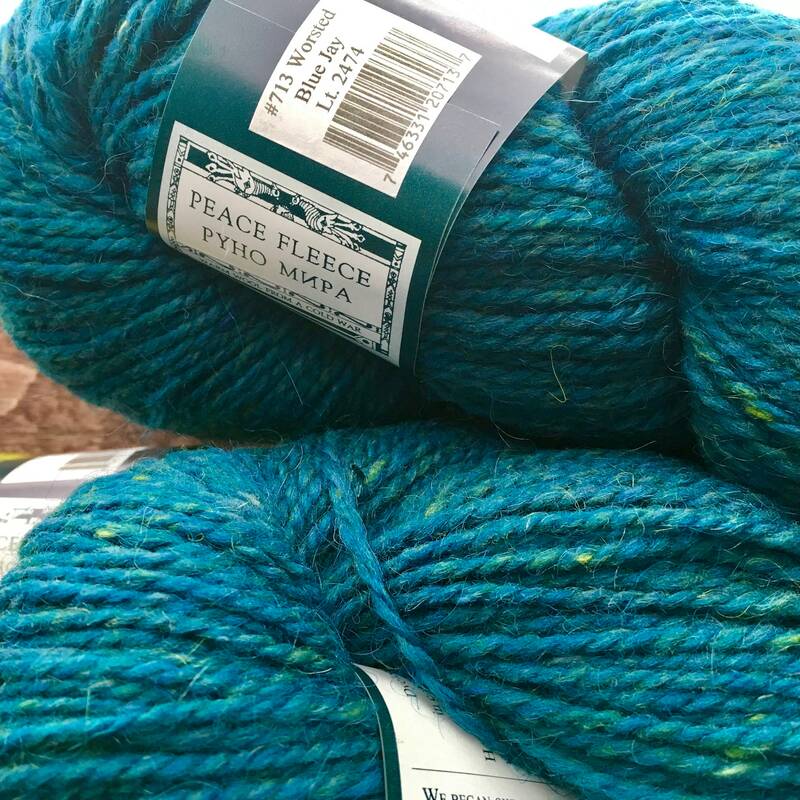 Peace Fleece worsted weight yarn is easy to substitute in any pattern calling for worsted weight yarn, but don't expect it to be silky and want to be petted. 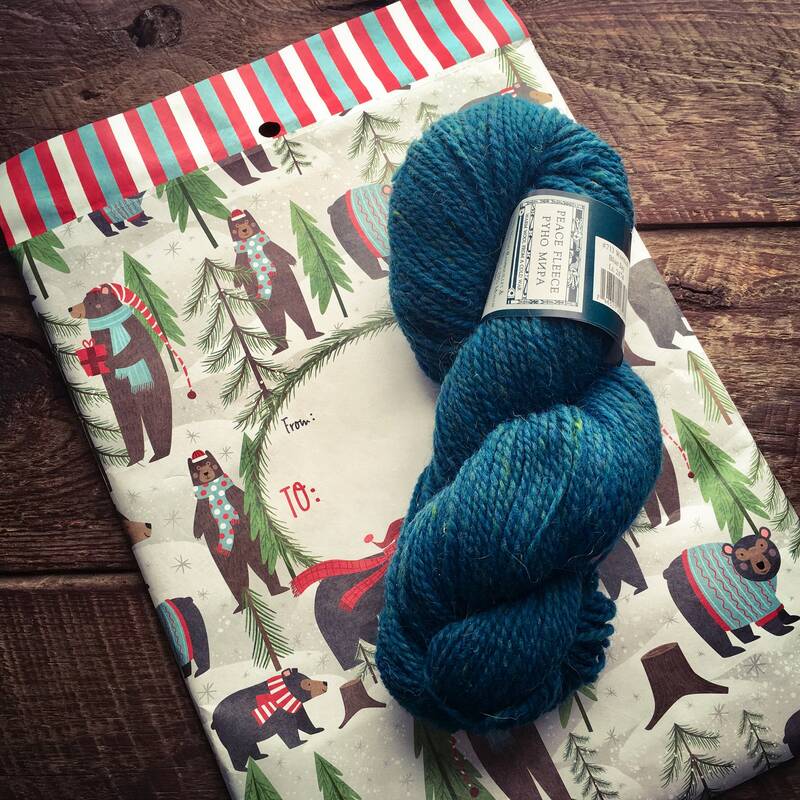 This yarn is soft but is not overly refined and processed soft. It has a rugged softness that will impress you as the years go by. 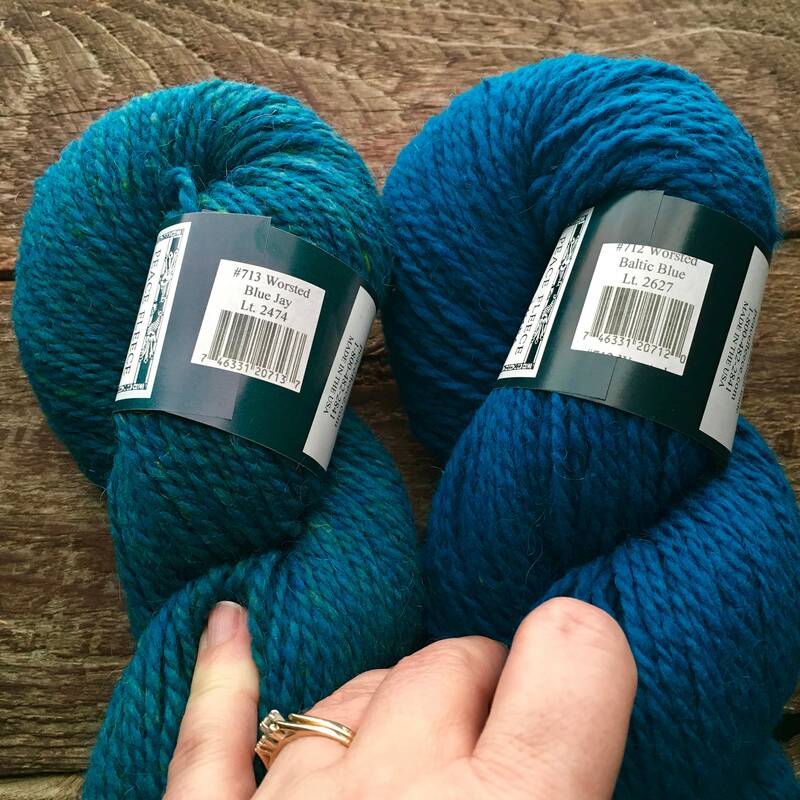 You can use this yarn as a knitting wool or as a crocheting yarn. I have seen some beautiful afghans done with Peace Fleece; you just can't beat the saturated colors! 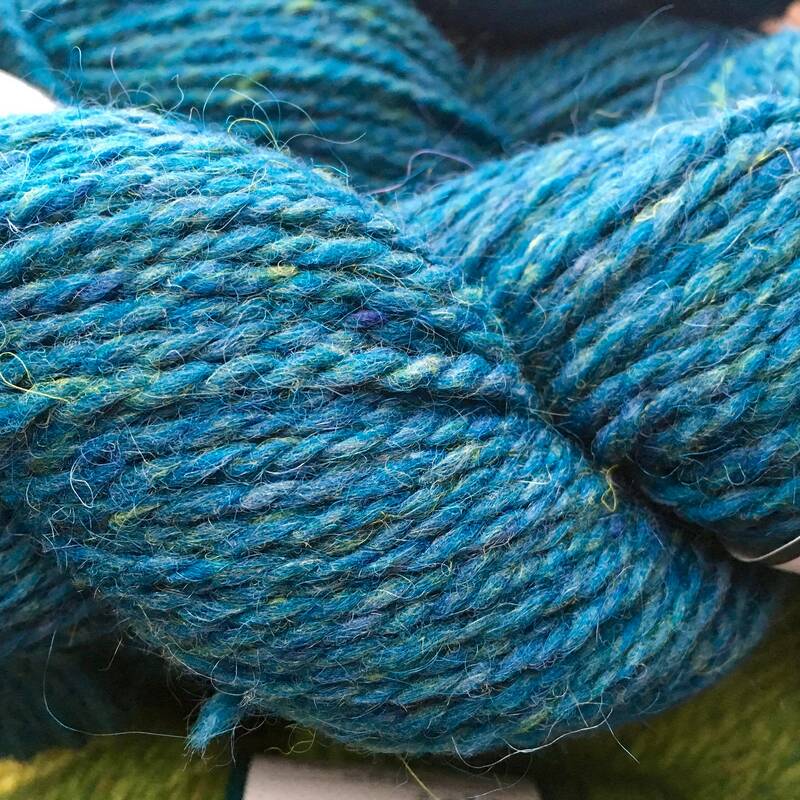 This yarn feels stiff while knitting, but don't judge it until you wash it. You will see it relaxes the more it is washed & worn, quickly becoming your favorite! Wool is Elastic and Durable - You can bend a single wool fiber 20,000 times, and it still returns to its original shape! This durability leaves woolen clothing looking good for longer – and raises the health and practicality benefits of wool! 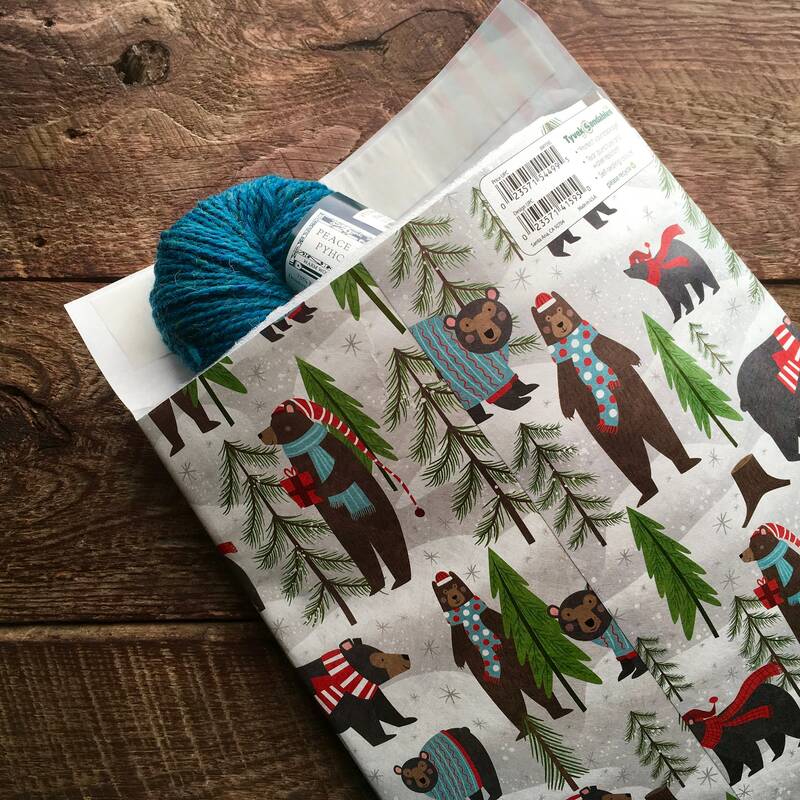 **Complies with CPSIA requirements so you can make your children and baby items with confidence. **Peace Fleece does contain vegetable matter. They have chosen not to use the "carbonizing" process where the wool is dipped into sulphuric acid to remove bits of dried grass. Thus their yarn is free from this chemical. 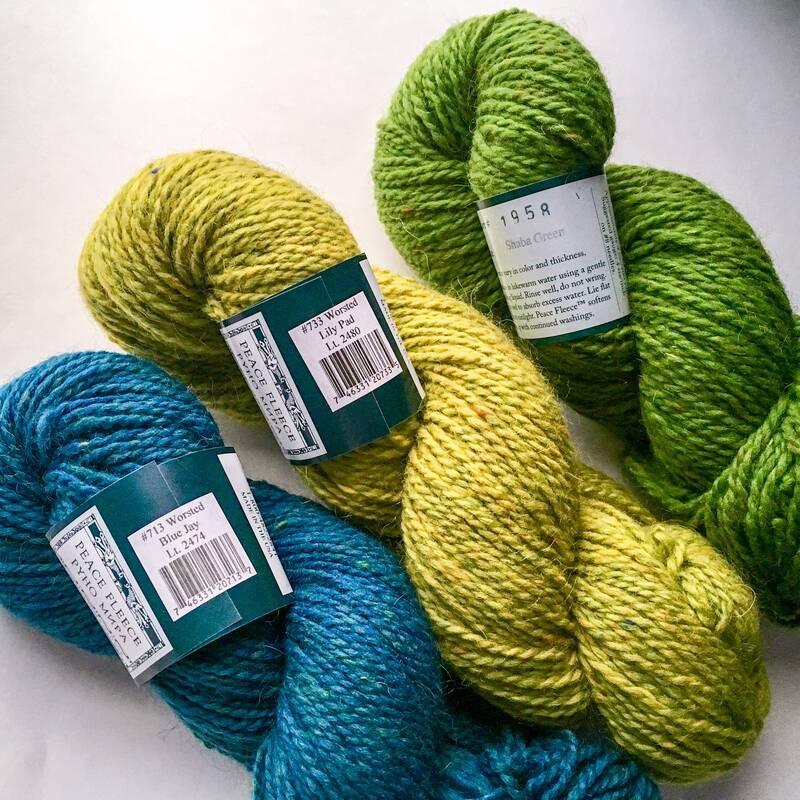 The minimal amount of vegetable matter that remains after the finished process is easily removed as you work and reminds you that this yarn is an end product given to us by real sheep. I have not yet begun my knitting project but I like the yarn very much. The color is beautiful. The yarn arrived very quickly and was well packed. Based on my experience, I would recommend this shop. 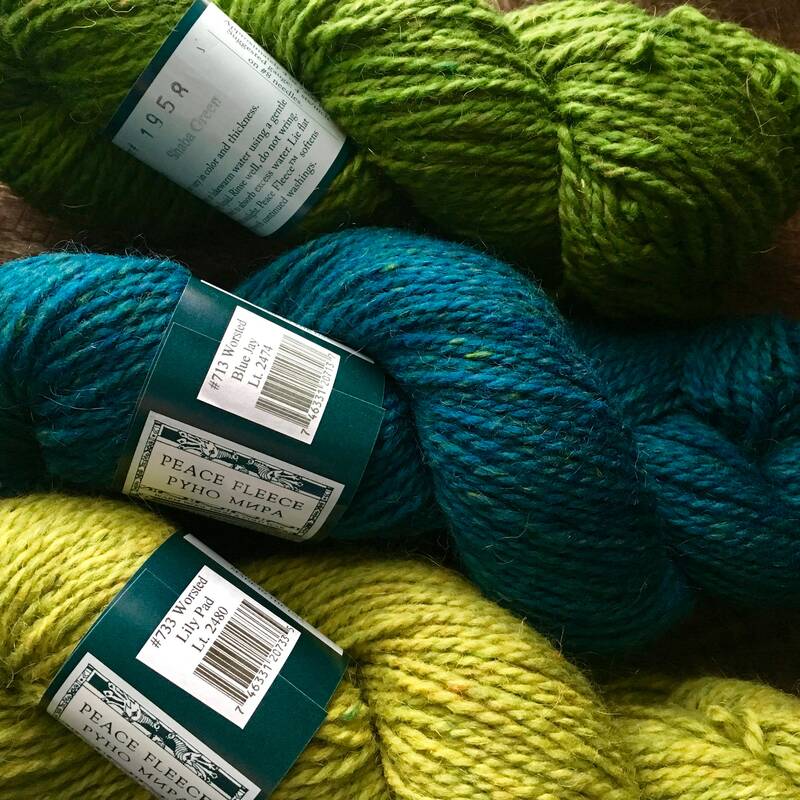 Great quality wool at a very fair price. Thanks.